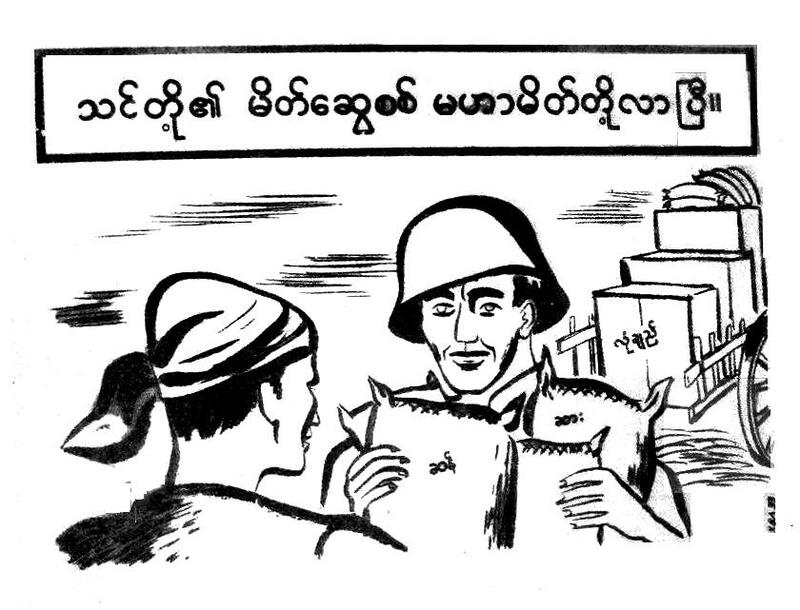 The Office of War Information produced a great number of leaflets for Burma in 1945. 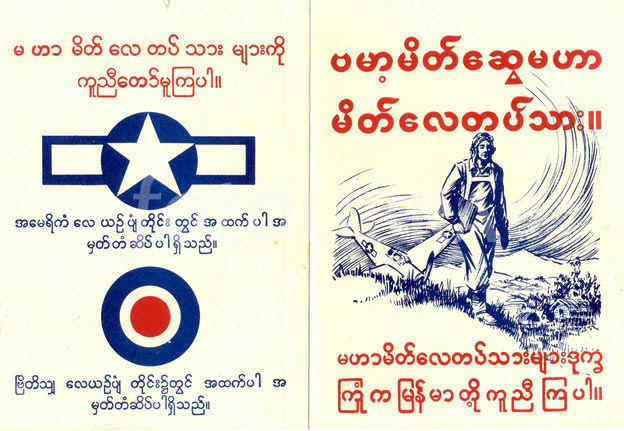 The codes for U.S. leaflets aimed at Burma usually start with a CB which is Civilians Burma. The full codes of some of the leaflets we know about are CBA, CBG, CBM, CBN, and CBP. Others may exist. 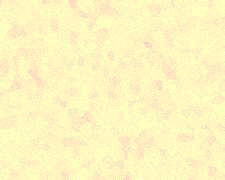 In general the last letter "A" indicates an appeal, the letter "G" indicates a gift, the letter "M" indicates a morale leaflet, the letter "N" indicates a newspaper, and the letter "P" indicates a pictorial publication. There is an entire second series for Burma prepared by the Americans. These all start with an X, and seem to be more for the various minorities in that nation. Some of the known codes are X, XBA, XBEA, XBM, XBN, XBSHa, XEA, XEN, XKA, XKaM, XKaN, XKN, XM, XHhA, XShM, XShn AND XShNL. 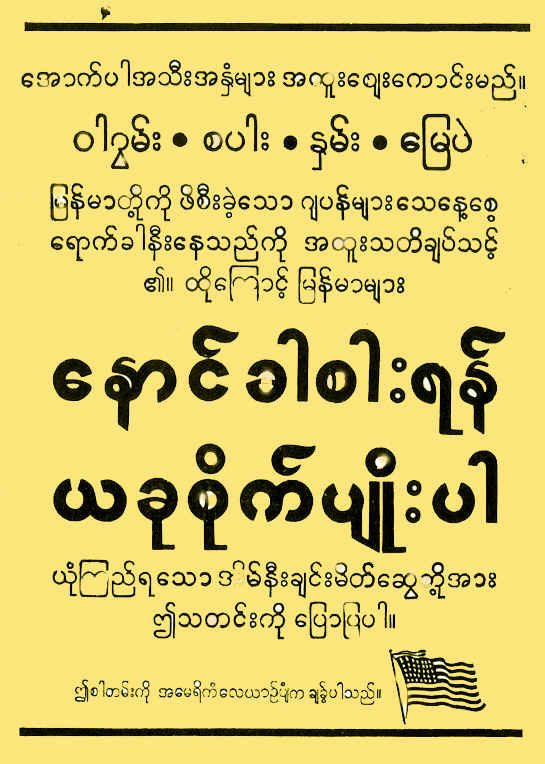 In the case of these leaflets we know that the SH represents the Shan people and the Ka represents the Kachin people. 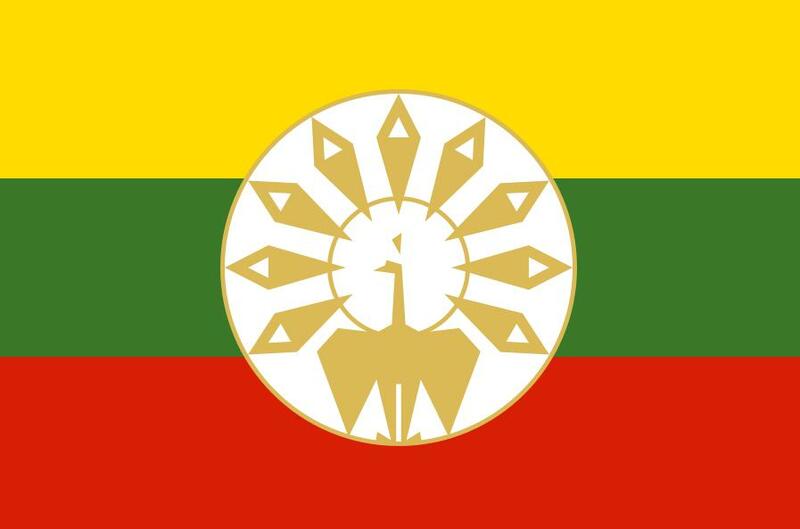 The Kachins were very loyal to the Americans and fought beside them in Burma. This is just a very short report written as a link to the larger OWI article so we will give a few examples but go into no great detail. 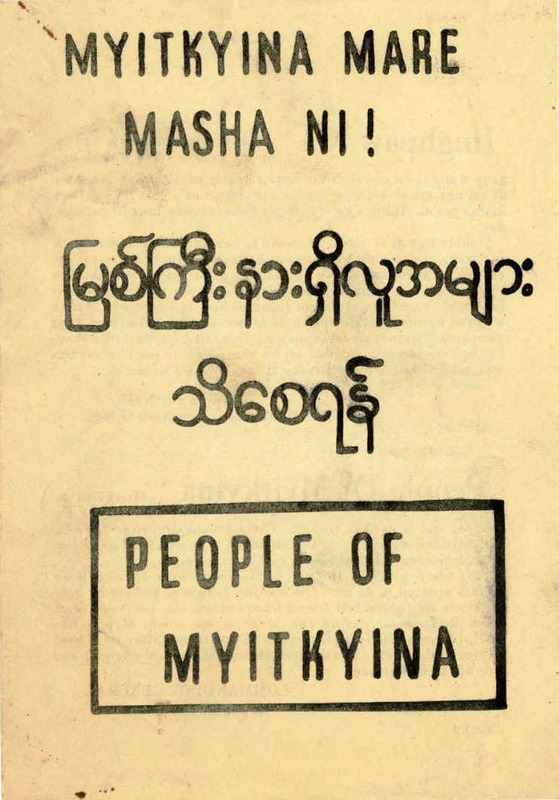 Great Britain also produced numerous leaflets for Burma. 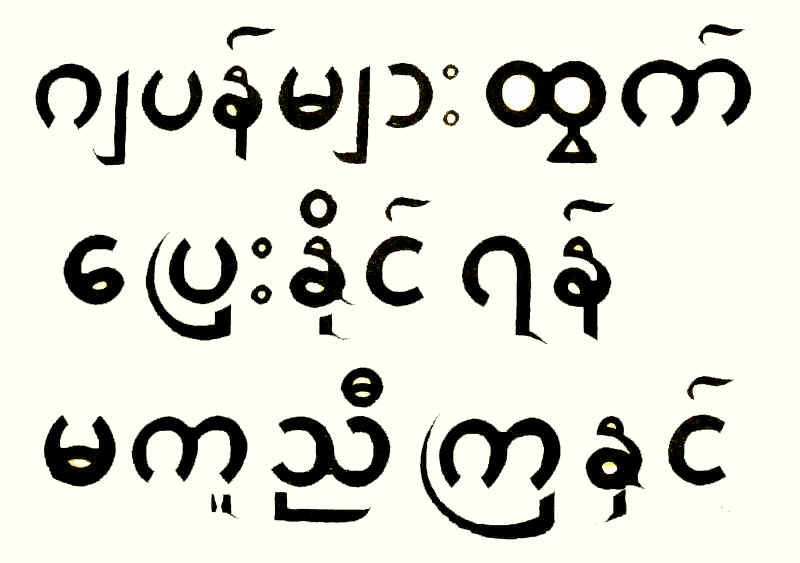 The British used an S code for Southeast Asia followed by a B For Burma. Some of the codes for the British leaflets are: SB and SBN. For your own safety, when you hear the Japanese are coming, leave your village at once. Do not return until three or four days after the Japanese have left. These are American planes flying over your land. From this great height people down below look like small ants. That is why pilots cannot always tell friends from foe. To be safe, stay away from the Japanese. I am flying over your land to kill Japanese and to destroy their supplies. I have no other purpose here. Stay away from Japanese military places. DANGER! BOMBS FOR THE JAPANESE! These are American planes flying over your land. From this great height, people down below look like small dots. That is why pilots cannot always tell friends from foe. To be safe, stay away from the Japanese! A message from the pilot of the plane overhead. The days of the Japanese in Burma are numbered. Everywhere the Allies are smashing the invaders. My plane is helping to rout the Japanese. The bombs I drop and the machine gun bullets I fire are speeding the day of liberation. But from the air, I cannot tell friend from foe. I must attack everywhere there are Japanese, from the biggest towns to the smallest villages. Burmese, I do not want to hurt you. I urge you to stay off the roads. Keep away from the railway. If possible, hide in the jungle. STAY AWAY FROM THE JAPANESE. 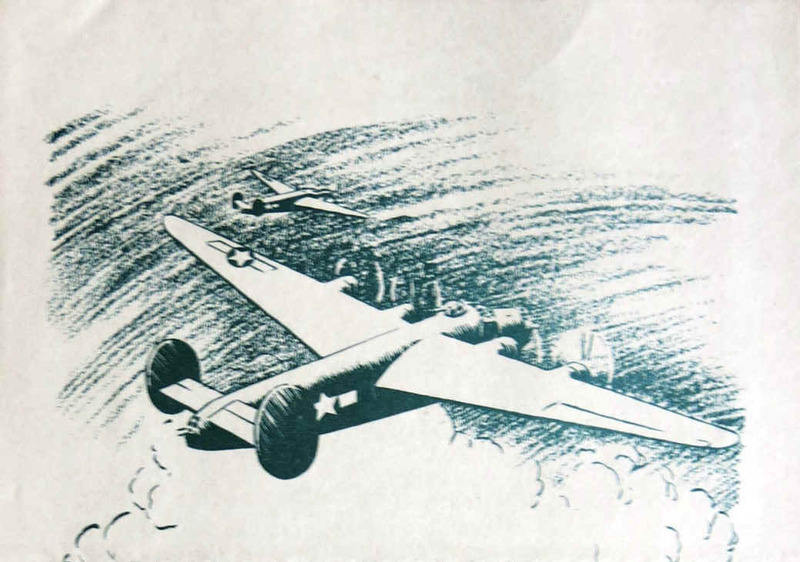 It is interesting to note that the previous leaflet, CBA-43, had a very similar message, but instead of a medium bomber, it depicted the four-engine Consolidated B-24 Liberator heavy bomber. Cotton, Rice and Oil seeds. The days of the Japanese in Burma are numbered so please  Plant for the future. Please tell your trusted neighbors about this. This message came from an American airplane. The German military force has surrendered and the greatest war in history which turned Europe into a scene of carnage is now over. The Japanese military leaders are the ones who are leading your beloved country to disaster. They relied greatly on Japans Axis partners and embarked upon this adventurous war of so-called Greater East Asia. The grave responsibility of this policy is on their shoulders. 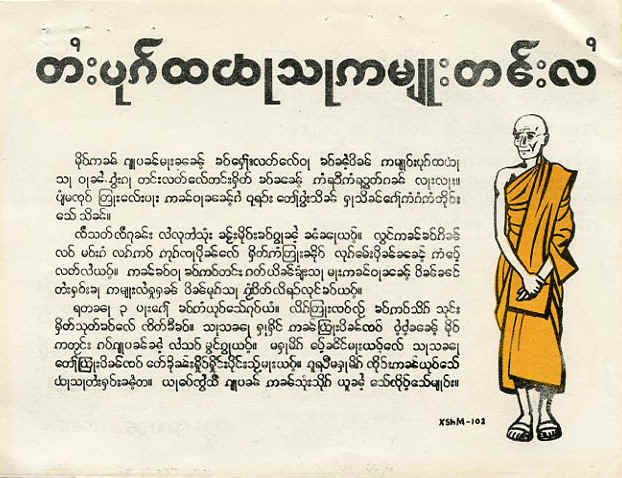 This 21 January 1945 Village Poster was printed in English, Burmese, Shan and Kachin. I depict the English version. 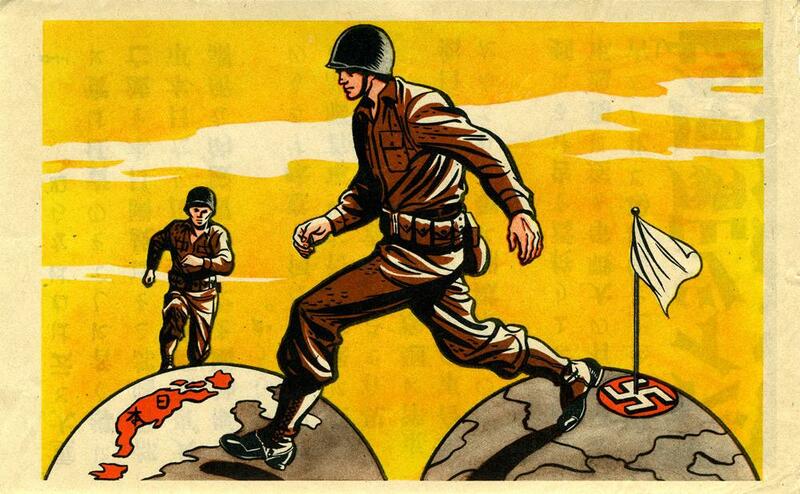 This poster was produced at the request of Headquarters, Northern Combat Area Command. The text was written by the Counter-Intelligence Corps which is also responsible for distribution. 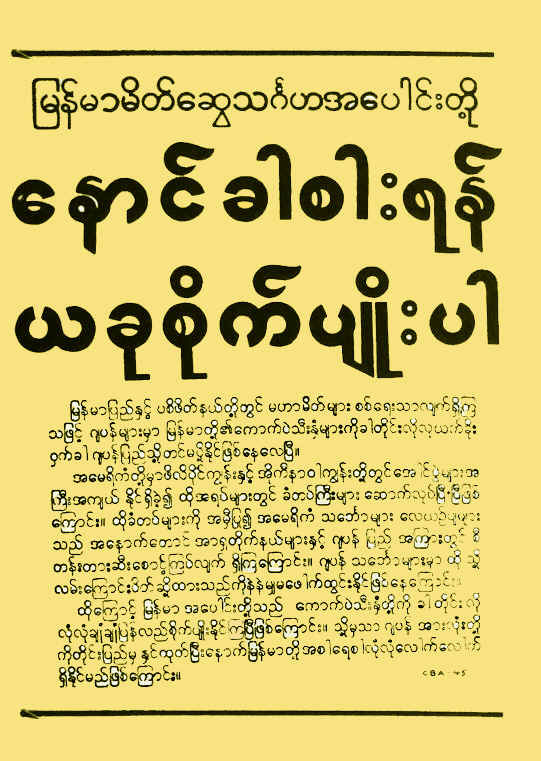 This four page leaflet bears messages in Kachin, Burmese, Japanese and English. 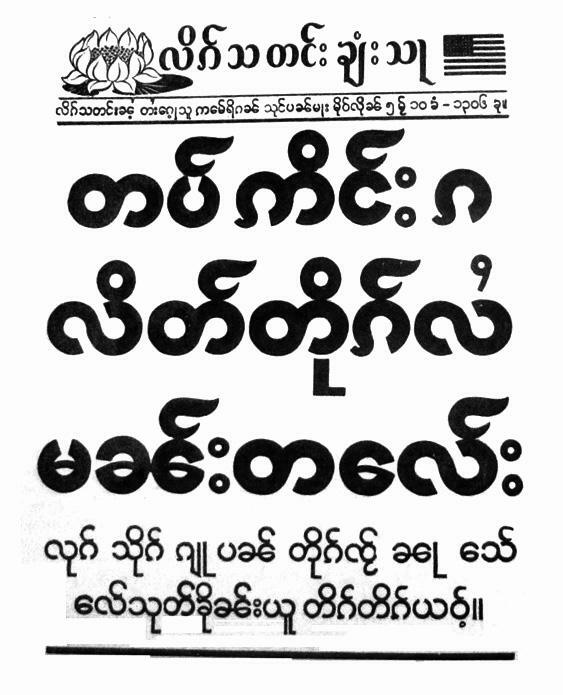 It is addressed to the people of Myitkyina. 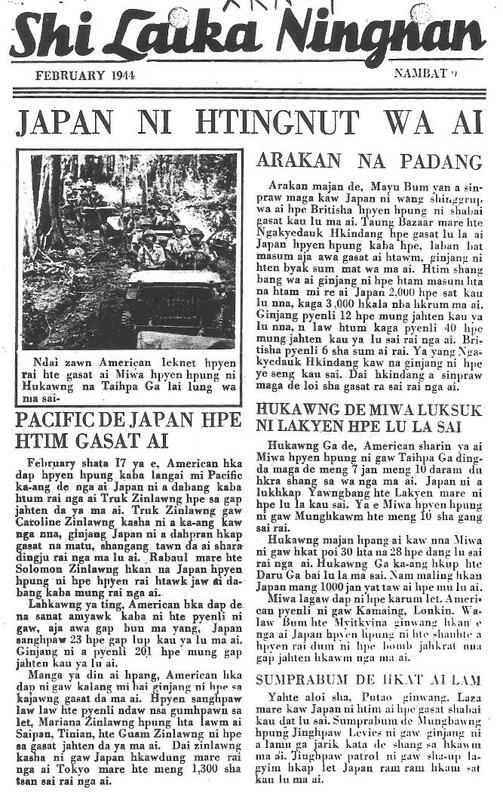 The second page is in Kachin and English and tells the people to wait to be rescued by Allied forces and not put themselves at risk. 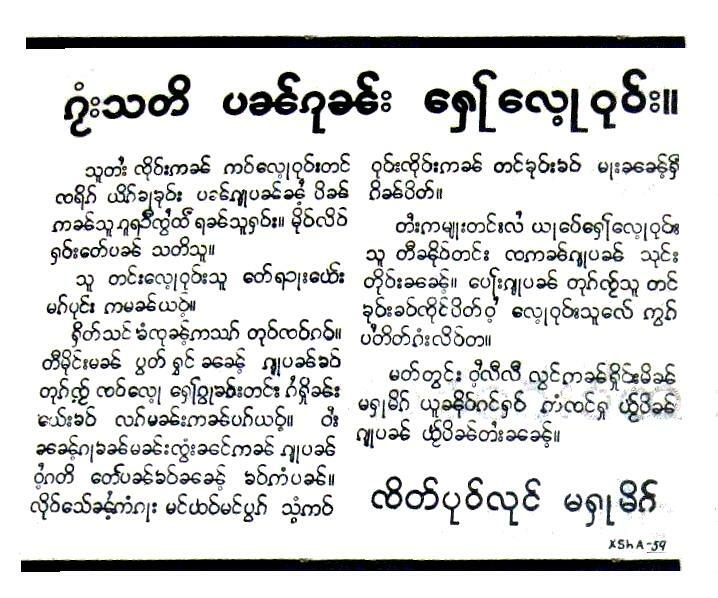 The third page is in Burmese and the final page is in Japanese and English and asks that any refugees from Myitkyina be treated well and turned over to the proper authorities. Myitkyina was the capital city of Kachin State in Burma. Japanese forces captured the town and nearby airbase in 1942. 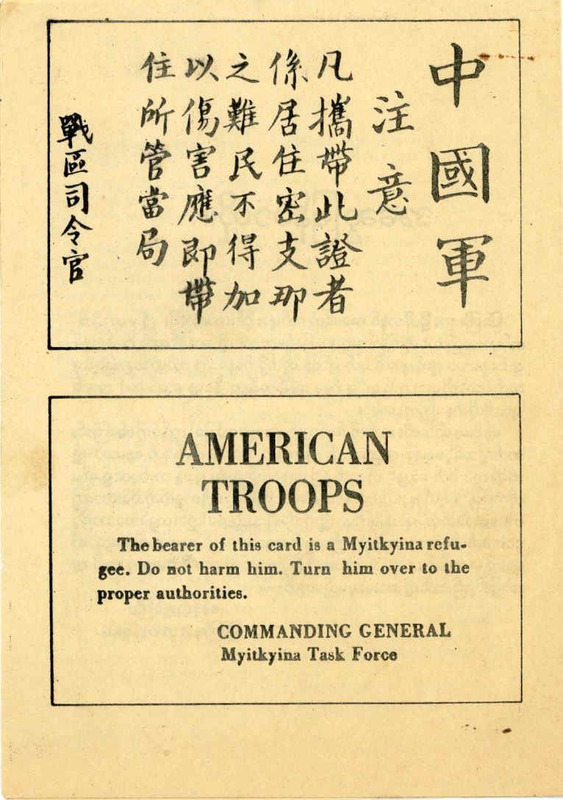 In August 1944, Myitkyina was recaptured by the Allied forces under General Joseph Stilwell after a prolonged siege and heavy fighting between Nationalist Chinese divisions, the Chindits, and Merrill's Marauders of the Northern Combat Area Command and the besieged elements of the 33rd Imperial Japanese Army under General Masaki Honda. Do you remember the spring of 1942 when the Japanese planes came? They brought with them the horror of war. The planes bombed the airfields at Loiwing and Lashio. They shot at people along the trails and in the clearings. Later  when the fighting drew near  people began to flee along the Burma Road. The Japanese planes came again. Day after day they dropped explosive bombs and shot their guns at people moving along the road. Hundreds of innocent people of the country were killed. 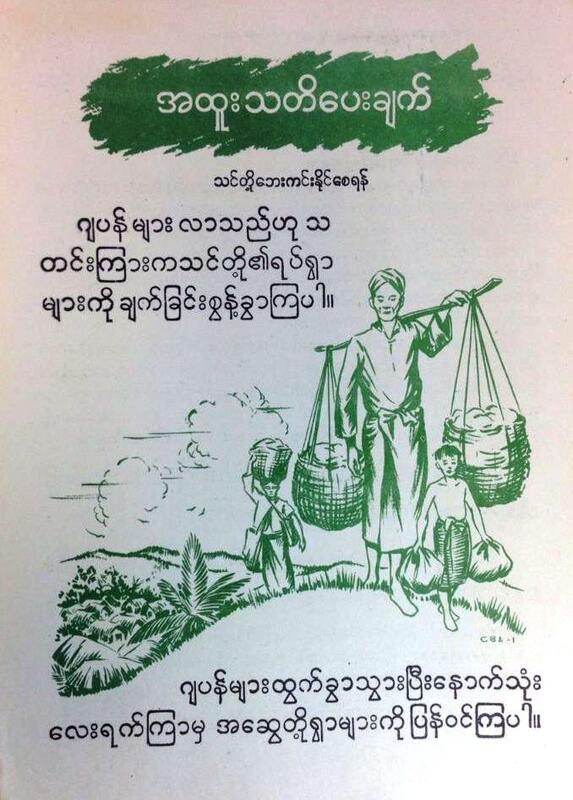 This is another of the appeal leaflets that are written in the languages of the Burmese tribes. 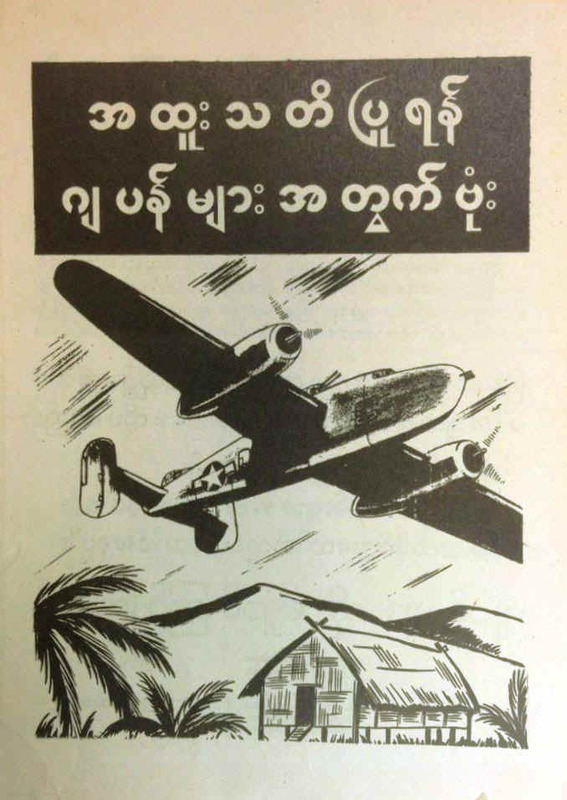 It was prepared in February 1945 as an air raid warning and bears the message in English, Burmese, Shan and Kachin. I show the English language text so the reader can get a better feel for the message. 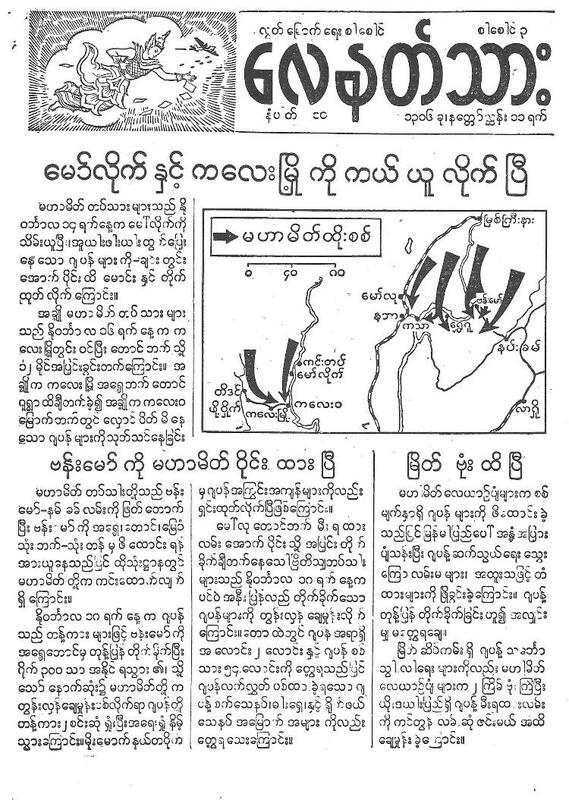 Other XA leaflets in my file are XA-53 (People of the Hsenwi and Kutkai areas), XA-54 (bomb warning for Hsipaw State), XA-58 (Do not give information), XA-60 (Combat zone warning) and XA-61 (Wanted Traitors). This is an interesting image depicting a Japanese soldier stealing food from a Burmese farmer, and then slapping his face when he resists. The Japanese slap is an amazing form of punishment. Reading military reports it seems that the senior officers slapped young officers, the young officers slapped their sergeants, the sergeants slapped the privates and the privates slapped civilians. It appears they did not see it as an insult, just a form of chastisement. The point of the slap is to debase the person being slapped, because the person doing the slapping is in the position of a superior inflicting pain on an inferior. Of course, in most other cultures it was a major insult and a form of debasement. It appears that the Japanese did not see the slap as a strong insult as other cultures did. It was a lesser form of punishment or correction than using a stick or a fist. The American propagandists used this slap image in several leaflets. In one to Thailand they depicted a Japanese soldier slapping a monk. 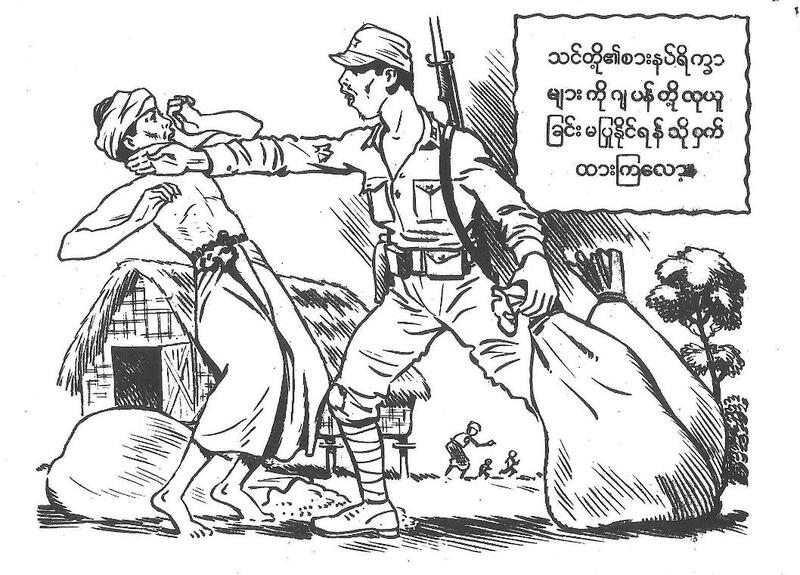 In this leaflet to Burma the soldier slaps a farmer. 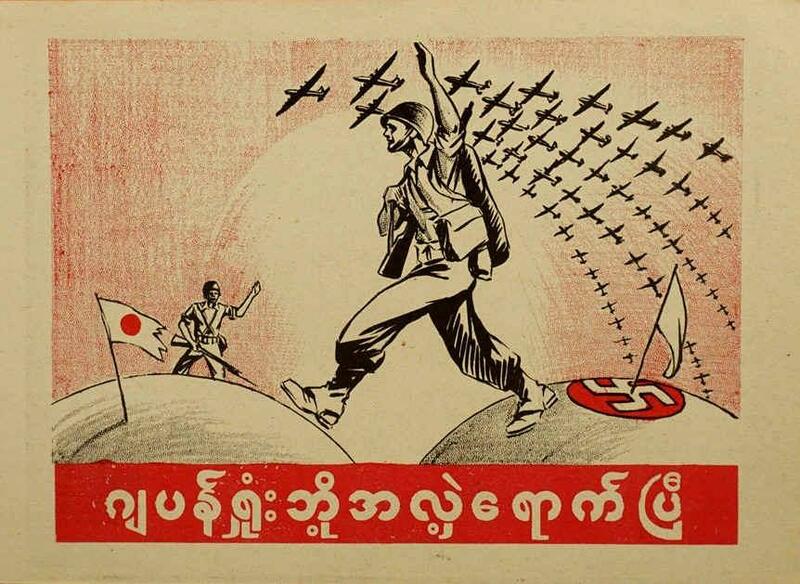 The image was considered so powerful that it was used on several different leaflets printed in Burmese, Shan and Kachin, each with a different code number such as XKaA-15, XShA-15 and XBA-15. The Allies are coming. They are your friends. Burmans! The Japanese are in full flight down railroad. The Allies are coming in great strength. Soon they will arrive in your area. Do not be afraid. 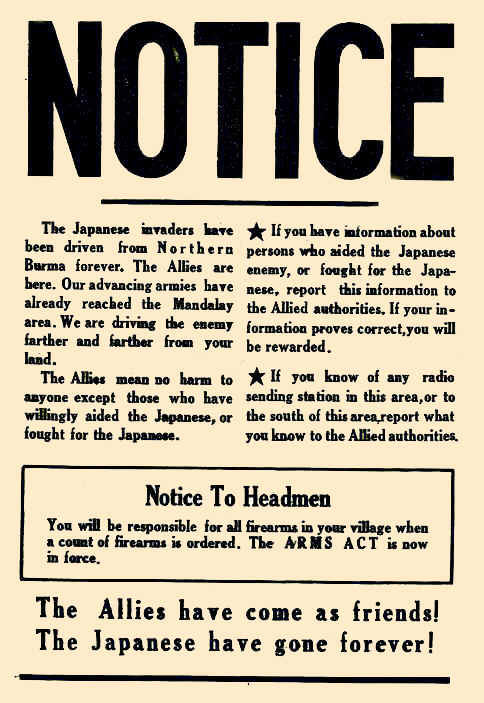 The Allies have only one enemy  the Japanese. 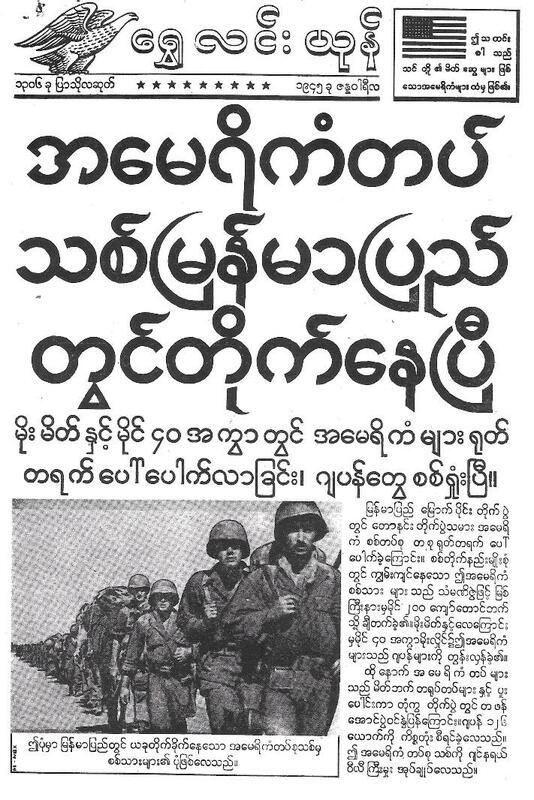 The Allies will treat the Burmese as friends. ABANDON YOUR BULLOCK CART AND RUN AWAY. WARNING - BULLOCK CART DRIVERS! 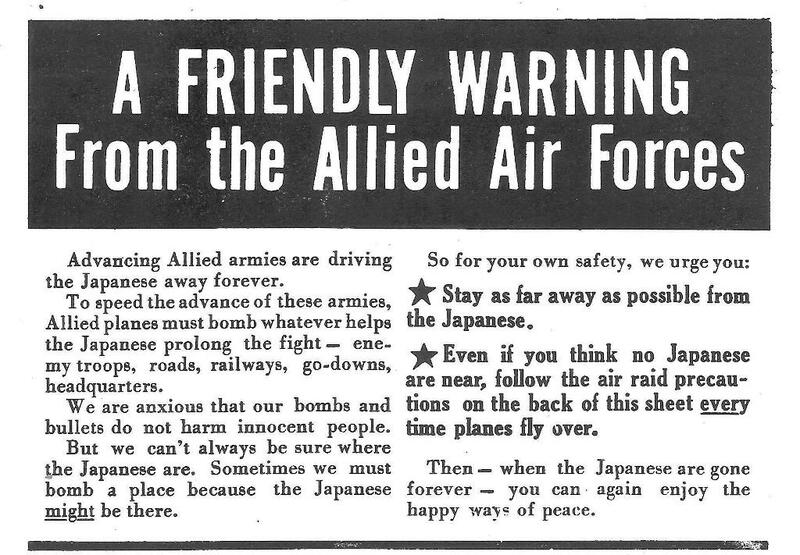 You Shans who hail Japanese supplies in your bullock carts are helping our enemy  we warn you now: You and your carts may be bombed. Why expose yourself? In North Burma, the Japanese forced cart owners to drive hundreds of mile away from home. Then the Japanese refused to pay what was promised. Sometimes they even killed the bullocks for food. Shans! Do not drive your carts on roads used by the Japanese. If the Japanese force you to haul their supplies, abandon your bullock cart and run away. Remember from the skies, Allied planes cannot tell Shans from Japanese. 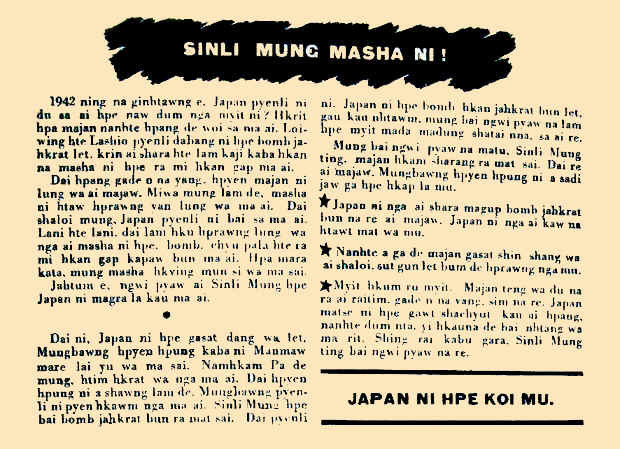 Other similar warnings in my files from the XShA leaflets are Number 9 (Do not fight for the Japanese), 42 (This is a stern warning), and 57 (Stay away from roads and trails used by the Japanese). The Buddhist religion is destined to flourish for five thousand years. But, under the Japanese it became temporarily darkened, like the moon in eclipse. Chinese soldiers, trained and equipped by the Americans are advancing against the Japanese; American naval forces attacked Truk Island on 17 February; America builds great ships to attack the Japanese; and Germany retreats in Russia. Mawlaik and Kalemyo freed from Japanese yoke; Pipeline carries oil from Calcutta, India to Burma; Japans defeat is Burmas victory; German battleship Tirpitz sunk; and 24 Japanese ships sunk; Philippine liberation progresses; Massed Allied armies advance into Germany. 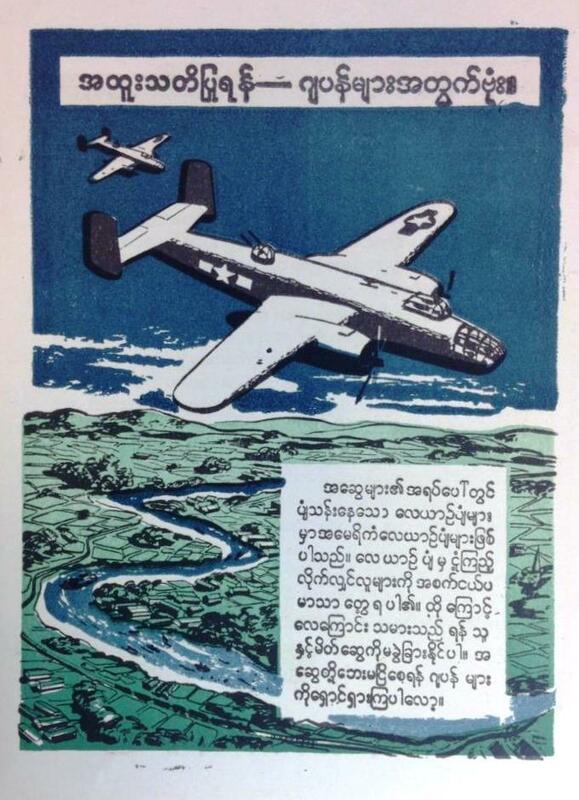 I should point out that I depict some other leaflets used in Burma, some in full color, in my articles on the Heavy Bomber [Link] and the Allied banknotes of WWII [Link].